Posted by Wendy Hay in All recipes, Drinks, More or Less! It’s winter here in New Zealand dark, damp and rather chilly. Add to that I have a cold. You know, headache, sore throat and a teny, tiny cough. I’m rugged up warm at home hoping to beat this in one day and save my work colleagues from my germs! Coincidentally, I have a a tree full of lovely lemons. For the first time in about six years the tree is totally laden. Maybe the reason is that this year it has shared its section of our yard with our rescue chickens. But that’s another story. So what’s is the best thing for a sore throat when you have lovely fresh lemons? You make some soothing Lemon Ginger tea. In a pot place lemon rind and juice, ginger, honey and water. Simmer for around 10 minutes until it is reduced slightly. Strain into a cup and taste for sweetness. 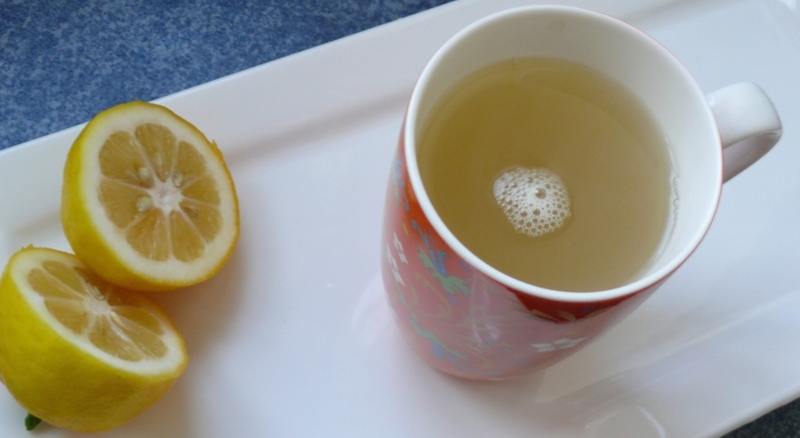 Take your Lemon Ginger tea and climb back into a warm bed. Yum, I’ve never had it with honey before, I’ll have to give it a try! Honey is tasty, and better for you than the nasty sweetener that begins with ‘s’!